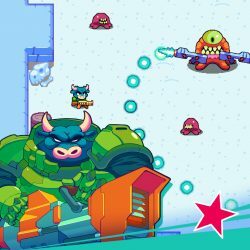 Hello everyone, you can finally download Trigger Heroes for iPhone & iPad and experience a fun and unique top down shooter one with simple one touch controls that make this game really addicting and fun. Today we will highlight a top down shooter that is brand new and it is completely free to download on your iOS device. 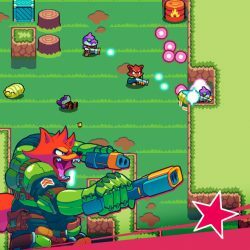 Trigger Heroes was made by a studio known as Lucky Kats and I have to admit, the colorful graphics and fast paced gameplay really hook you in. You can be playing for hours without even realizing it. The controls make it easy to adjust and learn so you, your friend, your brother, your sister or your child will have no problem getting used to the gameplay style. Not to mention Trigger Heroes also has a bunch of characters that you can unlock as you play. 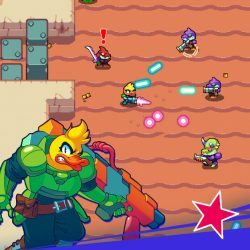 What Is Trigger Heroes Game About? 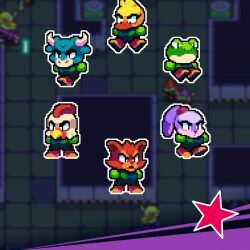 Trigger Heroes makes you blast your way through hordes of enemies with none stop action and adventure. Help Red and his mates take back their beloved planet Orbitus from the evil mercenaries called Shogun Inc. The last survivors depend on you. 5 unique environments with stage bosses!